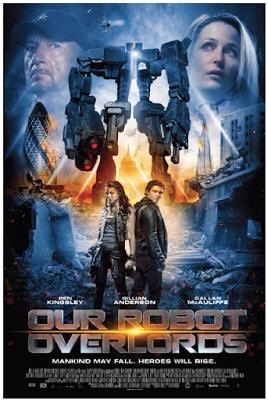 So, cross I, Robot with Transformers and Terminator and you have the trailer for Robot Overlords. This fabulous piece of cinema is UK born which means we have a bit to wait for it to make its way to The States. The tag line listed on IMDB is, ‘Robots never lie …’ … uh huh. That being said, the cast has me interested. That and the fact that both Em and I would be equally entertained by this one, since a good action flick is a crowd pleaser. Set it in a ‘distant galaxy’ and throw the likes of Ben Kingsley and Gillian Anderson at me and you have a definite yes. What do you think, geeks? I’m going to wait for the UK buzz after the release on 15 March, but I’m fairly certain I’m watching this one. This entry was posted in Film, Trailers, Uncategorized and tagged Ben Kingsley, Film, Gillian Anderson, Robot Overlord, Science Fiction. Bookmark the permalink.